More information on taxes is on the State of New Mexico Taxation and Revenue website. 1. YOUR NOTICE OF VALUE IS THE KEY TO UNDERSTANDING YOUR PROPERTY TAX PROCESS. Look for it to arrive via US mail in April of every year. Each year, the Assessor mails each property owner a "Notice of Value." This form serves to inform the owner of the total assessed value, the property description, and exemptions applied to the property. Sierra County typically mails notices on or around March 31st of each year. This form is an important step in the property tax process. It is very important that property owners examine the valuation figures on the form; these figures will be used to calculate the tax owed once local government agencies and school districts set budgets and the tax rates are adopted. If you do not agree with the amount assessed on your property, you may appeal your valuation with the Assessor's Office. Please read the "Notice of Value" carefully and follow the instructions on the back. You have 30 days from the official mail date to apply for exemptions and benefits, or to appeal your valuation. Owners will be scheduled for an informal hearing to talk about any property value or what is listed as being on this property. If a property owner is not satisfied with the outcome of this informal meeting, a formal hearing will be scheduled before the Sierra County Protest Valuation Review Board, which is composed of two citizens of Sierra County, and a representative of the State Taxation and Revenue Department. Did you know there are limits on valuation increases? Property that has changed ownership due to a sale. In this case the valuation cap is removed in the tax year after the sale date and the Assessor's valuation must be changed to reflect the market value of the year of the sale date. This is especially important to potential home buyers. Please be aware of the potential increase in propert tax valuation that could lead to increased taxes. Property that is placed on the tax rolls for the first time, such as a new home. Any new improvements made to property in the year prior to current tax year such as additions or outbuildings. Property whose use or zoning has changed. Do you qualify for a tax payer benefit? The head of Family Exemption is a $2,000 reduction of the taxable value of your residential real estate. Only one person in a household may qualify as Head of Family, and the exemption may only be applied in one county in the state. Essentially, any New Mexico resident who provides more than half the cost of support to the household may qualify. Dependants are not a requirement. By claiming this exemption you may save between $47 and $49 per year in taxes, depending on the tax district in which your property is located. 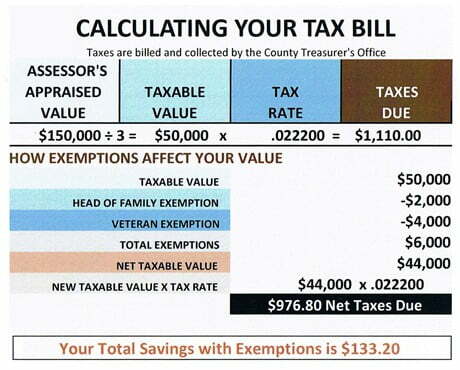 The Veterans' Exemption is a $4,000 reduction in the taxable value of your real estate. Any honorably discharged veteran (or the veterans' unmarried surviving spouse) who has applied with the New Mexico Veterans Service Commission and has been issued a "certificate of eligibility" may qualify for this benefit. For first time applicants, the certificate must be presented to the Assessor's Office within the deadline. Once the exemption is claimed and applied, it remains applied to the property until the ownership of that property changes. With this exemption you may save between $94 and $98 per year in taxes, depending on the tax district in which your property is located. Any veteran who is deemed 100 percent disabled (or the veteran's unmarried suriviging spouse) who has applied with the New Mexico Veterans Service Commission and has been issued a “certificate of eligibility” may qualify for a 100 percent exemption from property taxes on his or her place of residence. Once the exemption is claimed and applied, it will remain applied to the property until the ownerhips of that property changes. Other circumstances may apply. If you are 65 years or older OR permanently disabled (at any age) AND had a modified gross income of $32,000 or less in 2008, you may apply for a property-valuation freeze for your residence. Applications must be submitted along with proof of income, age and disability. Freezing your valuation will help minimize your property value increases. WHEN IS THE DEADLINE TO APPLY FOR EXEMPTIONS? The deadline for claiming the head of family, Veterans, 100% Disabled Veteran Exemption, and the Valuation Freeze is 30 days after the official date of mailing as indicated yearly on the Assessor's official "Notice of Value." Sierra County typically mails notices on or around March 31st of each year. Exemptions must be claimed in person at our office. * All aspects and laws relating to property tax assessment are not covered here. For more information on other topics please visit our office at 100 N. Date, or call us at 575-894-2589. Taxes are billed and collected by the County Treasurer's office. Why did my property value go up 3% this year when the market is declining? Most likely the value on your residential property assessment increased 3% because the assessor's valuation has been capped in prior years while the market was increasing by much more than 3%. It may have been capped between 1-9 years, depending on how long you have owned your home. The state law capping increases at 3% per year went into effect in 2001. The assessor's capped value may be very low relative to the real time market value and therefore may not reflect the current market value, thus it may be re-appraised and increased by up to 3% per year. New Mexico law requires the disclosure of residential sales informatino to the County Assessor's Office. This must be accomplished by filing a notarized affidavit at the Assessor's Office within thirty (30) days of the date of filing a deed, real estate contract or memorandum of real estate contract with the County Clerk. There are some exceptions for having to comply with the disclosure. The exceptions are listed on the back of the required form. All information collected is required to be kept confidential with the Assessor's office, and will not be made available as public information. Failure to comply with this law could result in a conviction of a misdemeanor, punishable by the imposition of a fine of not more than one thousand dollars ($1,000). Free notary service is available in the building for this purpose.